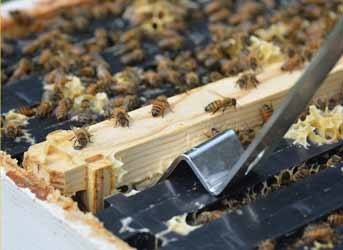 Ez-Pry Hive Tool is specifically designed to be the one essential tool for tending beehives. It eliminates the frustration many beekeepers have with the hive tools currently on the market. The Ez-Pry Hive Tool is designed to avoid damage to fragile frame ears and frame rests. Wide working surfaces break the wax and propolis seal by lifting the strongest part of the top bar. The "Z" delivers the leverage exactly where it is needed, not possible with a paint scraper! Makes frame removal quick, smooth and easy. Precisely engineered for wood and plastic frames. Doesn't damage frame ears or top bars. Integrated burr comb scraper and nail puller. Ez-Pry will pay for itself with increased productivity. Why is the Ez-Pry your go-to hive tool? It's easy on your equipment and your bees. Our patented "Z" gives you the power and control to get those propolized and burred frames out with smooth gentle leverage. We designed the stainless steel Ez-Pry because of our own frustration with the cheap "paint scraper" hive tools that come with beginner's kits. We wanted something that would give us control and save wear and tear on frame ears and top bars. Propolis-Etc now carries Ez-Pry Canadian beekeepers can buy Ez-Pry at local Propolis-Etc. stores!